Although it's a common myth that green tea is naturally caffeine free, green tea does contain caffeine. The short answer is that a cup of pure green tea usually contains around 25 milligrams of caffeine per 8-ounce serving. This is considered to be a low amount of caffeine. It's roughly 1/4 the amount of caffeine you'd find in a typical cup of coffee and roughly 1/2 the amount of caffeine you'd find in a typical cup of black tea. The more complex (and complete) answer is that the amount of caffeine in green tea varies from type to type, and green tea can contain anywhere from 12 mg of caffeine to 75 mg of caffeine, or even more for some types of Matcha Green Tea and other powdered green teas. 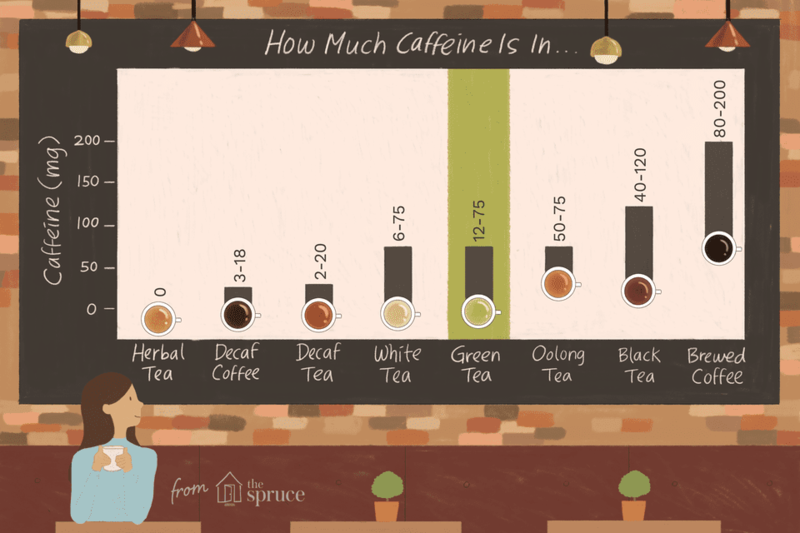 There are many factors that influence the level of caffeine in tea, including green teas. This is only a small sampling, of course, and it's dependent on many variables (the type of tea, proportion of water to tea, presence/absence of other ingredients, serving size, brewing time, etc.). Predicting the exact amount of caffeine in a given green tea is very difficult, very few companies publish their teas caffeine levels and you can't accurately test it without lab equipment. Skip the coffee house green teas. As you can see from the sample caffeine levels in green tea drinks from Starbucks and Caribou Coffeehouses, coffee shop green tea drinks tend to be higher in caffeine than other green tea drinks. Opt for decaf green tea. Remember that decaf green teas are NOT caffeine free, but they are lower in caffeine than other green teas. Don't try to 'decaffeinate at home'. Home tea decaffeination is a myth. Brew green tea correctly. Many people use boiling water to brew green tea or brew green tea for more than three to four minutes. This increases the level of caffeine in your cup. Instead, use simmering water and brew for 30 seconds to four minutes, with an optimal brew time of one-and-a-half minutes to three minutes for many green teas. Drink whole-leaf green tea instead of green tea bags. Teabags have more caffeine than loose-leaf tea (usually). Drink less tippy green teas. Tea buds or 'tips' are typically higher in caffeine than older, more mature leaves. For that reason, spring harvest teas (like Shincha) are often (but not always) higher in caffeine than late-harvest teas (like Bancha). Drink 'twig teas.' 'Twig teas' are made from the twigs, or stems, of the tea plant. They are naturally very low in caffeine. Popular twig teas include Kukicha and Houjicha. Avoid powdered green teas. Powdered green teas, such as Matcha, are consumed as a suspension instead of an infusion. That means you're drinking the leaf instead of an infusion of the leaf, and you're consuming every last bit of caffeine it has to offer. If you want a caffeine-free "tea" with a flavor that's roughly akin to green tea, we suggest a caffeine-free herbal tea/tisane like jiaogulan, green rooibos or lemon balm.